Oil and gas fields in the North Sea and elsewhere in the western world developed rapidly during the oil crisis of the seventies, when this commodity quadrupled in price. Now the first of approximately five hundred platforms have reached the end of their technical lifetime and need decommissioning. Heerema Marine Contractors has been involved in removing several complexes and here describes two cases, illuminating the survey aspects. Removal of facilities is very much an engineering challenge whereby safety and environmental issues play an important role. Historically, their installation involved surveyors who provided all precision positioning, dedicated equipment and proprietary software packages required. These packages calculated and displayed vessel position and any offset positions relevant to the tasks executed. But nowadays the surveyor no longer has a monopoly of real-time precise navigation; it is available from behind the console to which he once provided specialist services. The question arises as to whether (hydrographic) surveyors should be involved prior to and/or during decommissioning of these production facilities. The modern DP systems provide access to DGPS and USBL positioning and support underlying of geo-referenced CAD drawings. Locating the platform to be removed is a standard navigation skill, whereas detailed and sub-sea manoeuvring can be performed on the CAD drawing. This does, however, require the geodesy in the DP system to be set up correctly and adequate management of data provided by the client prior to the offshore phase. Anchor barges (without DP) have similar facilities at their disposal: a radar console supporting DGPS, Gyro and AIS input. This provides a helmsman with display very similar to that typically provided as a ‘tug management system’ by survey contractors. Most consoles also support ECDIS as background display, providing a rough indication of the facilities in the immediate vicinity of the anchor pattern. In more complex situations additional layers e.g. showing the infrastructure on the bottom can be displayed in ECDIS. Adoption of the available technology is, however, rather slow. Client specifications, a certain conservatism pervading the industry, and the convenience factor, continue to generate work for specialist survey services. These real-time services will probably be ripe for review as and when the volume of decommissioning work increases; cost-effectiveness will need to be assessed. But there are also new opportunities, to be discussed in the remainder of this feature. This covers the decommissioning of the Cohasset and Panuke platforms, which did not require survey services, and the NW Hutton Platform that requires quite different specialist services in the preparatory phase and a specific hydrographic service during decommissioning. This project revolved around the removal of a tripod and four-legged jacket in September 2005. Both were of a relatively recent date, implying the availability of early CAD drawings. In addition, both platforms had relatively small ‘single module’ top sides that would allow decommissioning using the same methods and lifting points as those used for the installation. The main concern was whether the old lifting points could be safely reused. HMC used its crane vessel Hermod, which relies on anchors for her positioning. A survey suite was not mobilised on the Hermod, and the radar with GPS, Gyro and AIS input was used instead. The anchor pattern was engineered beforehand, and anchor locations entered as targets on the radar console. Once anchored, the removal commenced with the removal of the topsides. Subsequent activity required ROV-assisted insertion of the airlift system to remove the soil plug from the foundation piles. Once the soil plugs were removed to a sufficient depth below seabed, abrasive cutting tools were inserted into the foundation piles. The length of the prefabricated rigging controlled the vertical position of the tools. Once all foundation piles had been cut, the tripod/ jacket was lifted off the seabed and landed on the deck, where the Panuke tripod was cut into manageable sections. The Cohasset jacket was transported to the Gulf of Mexico for scrapping. Figures 1 and 2 show, respectively, removal of the Panuke tripod and the Cohasset jacket. The availability of CAD drawings and a cutting level ‘below seabed’ meant this removal could be executed without conventional survey support. This, however, does not apply to older and/or bigger platforms, such as NW Hutton. The NW Hutton platform is substantially bigger, comprising a 154m-high jacket and 22-module topsides. The jacket is anchored to the seabed with 5x60m-long piles at each corner. The bottom 40m of the jacket will be left in situ. The first challenge is to obtain accurate dimensions of the modules on the top side that have been added and modified over the past 24 years. The platform originating from the pre-CAD era means little digital data is available. In addition, the original lifting points were removed as the modules were skidded onto their final locations. This is when specialist dimensional control technique comes into play: 3D laser scanning. Although the technique has been in existence for some years, only now, with such a large decommissioning project and the industry keen to work more safely and efficiently, is it too embracing the technology. The advantage for decommissioning contractors like HMC is that they are provided with 3D-CAD data suitable for structural engineering, allowing detailed project preparation. The advantage for the operator is a reduction in decommissioning costs through reduced hours spent offshore. A laser scanner is capable of building an accurate 1:1 model based on millions of points. Specialist software interprets scan data and exports the results in CAD-compatible format. Engineering firm Passe-Partout provided Figure 3, showing data acquired onboard a production platform. Laser scanning is focused on charting surface facilities, whilst the platforms to be removed include a substantial sub-sea portion. First attempts to replicate the laser scanning technology using sonar data look promising but require additional input to resolve ambiguity caused by sparser datasets. Once the engineering phase is complete, the offshore phase commences. This involves the crane barge anchoring out at the NW Hutton location, using the radar with (D)GPS, Gyro and AIS input and the anchor target coordinates provided on the anchor plan. This procedure is identical to that followed for the Cohasset-Panuke platforms. The first phase of the decommissioning comprises removal of the topside modules. Once all these are removed, the jacket will be cut off 40m above seabed. In contrast to the Cohasset-Panuke, the cuts will be made using an external tool. During this phase it is essential that all cuts be made at the same level to ensure that all legs are the same in length and thus avoid instability when the jacket is back-loaded onto the transport barge. Cutting level will be established to within 0.1m. A ROV handheld Digiquartz will be used to locate the precise cutting level on the jacket. The Digiquartz readings will be ‘swell corrected’ by running them through a moving average routine. Although a moving average is not the optimum routine for low-pass filtering, it is deemed sufficient. In order to correct for tidal and barometric pressure variations, a Digiquartz Compatt will be installed in a seabed frame and interrogated every ten minutes to establish the correction for the ROV handheld Digiquartz. Figure 4 shows levelling requirements. The role of survey support services for decommissioning activities, as we have known them up to now will diminish thanks to the new tools available to nautical staff. These tools comprise sufficiently accurate positioning systems, radar with (D)GPS, Gyro and AIS input and facilities to underlay ECDIS and/ or CAD charts very similar to the displays provided by survey contractors. Several opportunities for survey companies emerge during the preparatory phase of removal projects. These opportunities include the execution of environmental baseline assessments to define the basis for the most environmentally friendly method of disposal, and accurate charting of facilities using laser above and sonar techniques below water. The availability of an appropriate dataset in the preparatory phase means the offshore phase can be executed more safely and effectively, thus saving offshore days. A core hydrographic task is likely to remain. 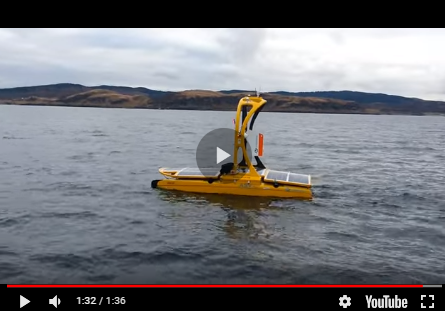 This will focus on determination of an accurate horizontal level at the cutting location and will need to be corrected for tidal and meteorological influences.